Duty – The defendant owed you a duty to keep you safe from harm while on his or her premises. Notice – The defendant either knew about or should have known about the dangerous condition that caused your accident. Dangerous Condition – An actual dangerous condition or unreasonable hazard existed. Damages – Your accident resulted in injuries that resulted in actual damages (medical bills, lost wages, etc.). Unfortunately, even if your case seems cut and dry, you may have a difficult time proving each of these elements to be true. That is where an experienced and resourceful Miami slip and fall lawyer comes in handy. What evidence is necessary to prove that the defendant owed you a duty all depends on the type of guest you were. For instance, if you were a business or social invitee, evidence might include a ticket stub, receipt of purchase, or actual invitation. If you were licensee—someone not specifically invited to the property but who was not kicked off the property once the property owner discovered your presence—your evidence might come in the form of another guest’s testimony or video footage. The establishment had actual constructive notice of the dangerous condition and did nothing to remedy it. This can come in the form of a written complaint, photographs, verbal complaint, or video footage. The dangerous condition existed for such a length of time that the establishment should have been reasonably aware of its presence. Again, you can use photographs, written complaints, and video footage to prove this. The condition was foreseeable because it occurred regularly, which can be proved via previous maintenance logs and customer complaints. You can also prove notice by showing lack of maintenance logs. If the accident occurred because the property owner failed to maintain a piece of equipment or the business deviated from industry practices, it may be enough to establish notice. It may seem obvious to you that a dangerous condition caused you to slip and fall, but for all the deciding party knows, you slipped and fell because of your own clumsiness. The best way to prove that the condition was in fact dangerous (and not just a minor defect or the result of wear and tear), you can present photographs, video footage, or eyewitness testimony. Damages might be the easiest element to prove, as you simply need to present medical bills, proof of missed work, and, if necessary, expert testimony regarding the outlook of your health and/or your mental state of mind post-accident. 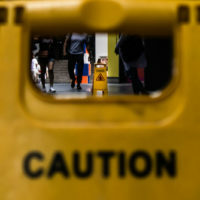 If you were involved in a slip and fall accident in Miami or a surrounding area, do not assume that your being injured is enough to recover compensation. You must prove the four elements of a premises liability case—duty, notice, dangerous condition, and damages—to be true. Work with the Miami team at Spencer Morgan Law to gather the evidence you need to recover the compensation you deserve. Call our team today to schedule your free consultation.